So much happiness in her face! Annie finally made it. Surrounded by cheering photographers and Journalists Annie arrived few minutes ago at the Parc Ferme’ in Buenos Aires. “You are the winner!” people shoutet! Everybody clapping hands! Dozens of Journalists and Photographers asked for photos and interviews welcoming Annie after her arrival in La Rural. 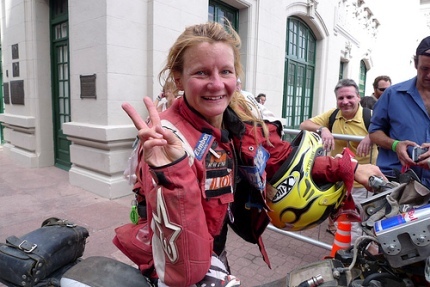 This entry was posted in 2009, Finish, Success and tagged Annie Seel, Dakar 2009, moto, motorsport, Rally Dakar 2009, superwoman. Even today’s special stage was shortened by some 300 km. This because of much rain in the area which had made most of the route impassable. Instead the competitors had a longer connection to reach the start. Only the last 220 km of the track was opened for the rally. Luckily there were no difficulties on the way, just to ride ahead. Winding route, a lot of fun. These kilometers were quite fast, an average of 70-100 km/h. And Annie kept up the speed through the whole stage. With an aching and immovable shoulder after the several crashes yesterday! She finished the stage as 61, just behind Mirjam Pol, her rival. This entry was posted in 2009 and tagged Annie Seel, Dakar 2009, rally, stage 13. The bike has run badly all day – very slow, consuming too much fuel etc. She got gas from people in the villages. Also Henrik Rahm, a fellow competitor, helped out. The malfunctioning bike also caused crashes. She is badly hurt in the shoulder. A rescue helicopter came and bandaged the shoulder, it ached terribly. Henrik wanted her to quit the race. No way!!! She was only 5 km from finish, at a river ridge and couldn’t get over. (Fiambala area) She needed help to find a passage. She tried to call/sms her rally-friend Henrik. But there was no connection. So Annie called home to Swden from her mobile phone in the evening. Sister Eila started a contact network. But in the meantime she found a way to get over the river-bed and made it to the finish. After that there were still 260 km liaison. Henrik finished at 7 pm (local time). A lot of trucks and cars were stuck too at the river. Many participants have criticized the route – sensless planning, terrain not suitable for rally vehicles etc. And too dangerous. It was a long day’s thrill also for all supporters. Many of them tried to get assistance for Annie. Thanks! This entry was posted in 2009, Health, Mechanical problems, Tough challenge and tagged Annie Seel, Dakar 2009, motorsport, rally. Stage 9, Jan 12 La Serena-Copiapo. Along the mountain side. Due to very soft and unstable sand at the end of the stage, it was shortened by 20 km. Still a long track, 430 km. Very stoney in the first part. Like riding marathon enduro, but with a too heavy bike, 170 kg. I had no problems with navigation, but all that dust made it difficult to keep up speed. Also the big stones made me fall a lot of times. I had thought that slowing down would be easy. So wrong! I got totally out of rhythm. So I changed to a higher gear – which payed off. Also the sandy part at the end was okay. I finished as 55 on the stage. Also the organizers will compensate me for time loss helping another rider last week, thus getting 20 min off my result. Don’t know how and when it is displayed. This entry was posted in 2009, Tough challenge and tagged Annie Seel, Dakar 2009, rally. Stage 8, jan 11 Valparaiso-La Serena. The first day of the rest of the race. Uphill and downhill, winding gravel roads. Very tricky. The first half of this stage I had full speed. But after refueling I slowed down because it was slippery, stony and dusty. I must save some strength for tomorrow – a long and tough day in dunes. Stage result 51. Quite an improvement! There are no limits to the spectators enthusiasm! As I passed them on my bike they came very close and wanted to touch me. Someone grabbed my arm so I wheeled right into the crowd. This entry was posted in 2009, Spectators and tagged Annie Seel, Dakar 2009, motorsport, rally. Well, that’s Dakar… pain and pleasure, hate and love – I take it all. And so I told the reporter too who interviewed me. It was shown on Eurosport. This entry was posted in 2009, Health and tagged Annie Seel, broken nose, Dakar 2009, helmet, injuries, motorsport, rally. Again the stage was reduced because of difficult terrain and the mountain-section was excluded. The trucks didn’t start att all, instead they went directly to Valparaiso. Annie’s riding was very good. Overtook many bikers, place about 50. But then got unlucky again: the shock absorber broke (is changed already 3 times! ), the front fork leaked oil into the break, so stopping was impossible. Fell several times and lost much time; finished as 60. Seems to have bad karma, jinxed with trouble… Anybody who knows voodoo? Some white magic could help. But the atmosphere is really fantastic! Never experienced so much enthusiasm among the spectators. Had no idea that rally is so big here. Several riders are south-americans, so it’s fun to have the rally here. It’s crowded everywhere, along the route and around the bivouacs – all ages from kids to oldies, parents showing up their babies to us, begging for autographs etc. The Latins are real party people. All support makes one feel excited and strong despite all hardship. Now it’s time for a shower and then rest. Half of the race is done and 71 bikers have abandoned. Annie’s total is 79. This entry was posted in 2009, Mechanical problems, Spectators, Tough challenge and tagged Annie Seel, Dakar 2009, motorsport, rally. There was a route modification for this stage due to the difficulties of the 5th stage. Many contestants had problems and finished very late, or even stayed the night on the track. They were wet, cold and tired having not slept. So the departure of the special section was postponed by two hours. Yesterday’s stage has been neutralized – that means no time limit – so all competitors have been authorized to start today. Because of an impassable river ford the special was reduced to only 178 km. The track was shorter, but still quite tricky. Annie had good speed in racing, overtook many bikers. Felt all right and happy at finish. Position 86 on this stage. Though must find out why 52 min penalty…? This entry was posted in 2009, Tough challenge and tagged Annie Seel, Dakar 2009, motorsport. Stage 5 Jan 7, Neuquen-San Rafaël. A disaster. For now I’m happy to be alive! At 358 km the front mudguard was torn off, maybe caused by a big stone. It got in the wheel and tore off the break cable too. It was an abrupt stop, I flew over the bike and crashed the front of the helmet. I barely saved my teeth, nose and eyes. But didn’t break my neck. I fixed the bike and struggled on. The last part of the stage was like hell – sand with vegetation, and rain and hail. But I made it to the finish, after 12 hrs as 121st. This entry was posted in 2009, Health, Mechanical problems, Tough challenge, Video and tagged Annie Seel, Dakar 2009, motorsport.